I love all the Metro L.A. expansions the noodle shops have been undergoing, lately.Â When I say lately, I mean especially within the past month or two.Â After all, I was never quite a South Bay (or Daikokuya) kind of gal. Yamadaya in Culver City. Shin-sen-gumi in Little Tokyo. Robata Jinya is even within the same proximity to my workplace as Ramen JinyaÂ is to my Hollywood apartment. Ikemen itself is not an expansion, but another project of Yasumasa Kawabata and Sean Nakamura – the latter of Ramen California fame. But Ikemen. I can walk there. I’m lucky because the parking at this plaza, quite frankly, is asÂ horrendous as you might expect parking would be for any establishment at theÂ Hollywood Boulevard and La Brea Avenue intersection. 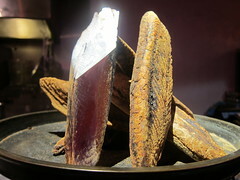 I went solo the other night and sat at the counter beneath several sticks of bonito. Equipped with the knowledge that tsukemen (dipping noodles)Â is their specialty, I ordered the Johnny Dip topped with pork (chicken is your other option). The dipping sauce is described as “Tonkotsu au jus mixed with green onions and Italian basil.”Â The non-traditional flavor was veryÂ good in that familiarly super rich way. Of course, the basil flavor was the most novel thing about it. The noodlesÂ were thick – all the better texture to sop up that delicious dipping broth. 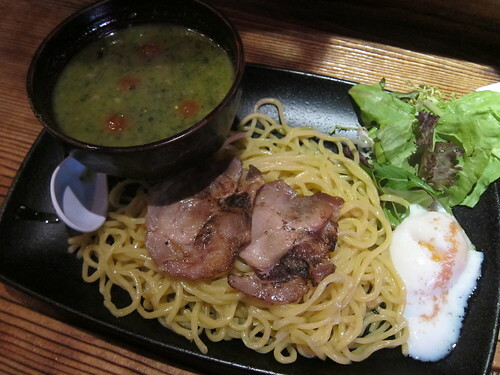 My next visit will be soon, and I’ve already decided on the Zebra Dip tsukemen, flavored with slowly roasted garlic. Only after then might I venture into traditional (or “genuine,” as Ikemen labels it) noodles in broth. Perhaps those recipes are from Ramen California? Oh, Hollywood. The best part about this ramen movement is that finally, ramen as drunk food really will become a reality. That is, really good ramen – and not just the dehydrated form we’ve all grown up with. 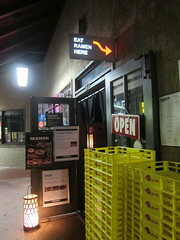 Ikemen is open until 12 AM on the weekdays and 4 AM on Fridays and Saturdays. With all the flack L.A. gets about last call and lack of late night food, Japanese noodles may turn out to be my saving grace. 1655 N. La Brea Ave. This entry was posted in Food, Hollywood, Late night and tagged dipping, Hollywood, Hollywood Blvd, Ikemen, Japanese, late night, noodles, ramen, Ramen California, Sean Nakamura, tsukemen. Bookmark the permalink.